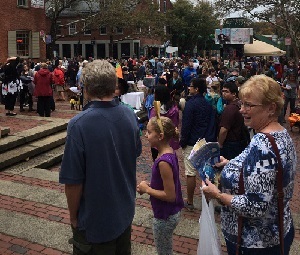 Nearly a dozen, local, pet-related small businesses and organizations answered the call to mount an interactive customer engagement promotion recently in Salem Ma. Rather than be blindly competitive to serve their own needs, they joined together to support a community event to entertain customers. “Howl-o-ween” was a pet parade and pet costume contest that drew 100 contestants (dogs & cats mostly) and an estimated crowd of several hundred on-lookers. 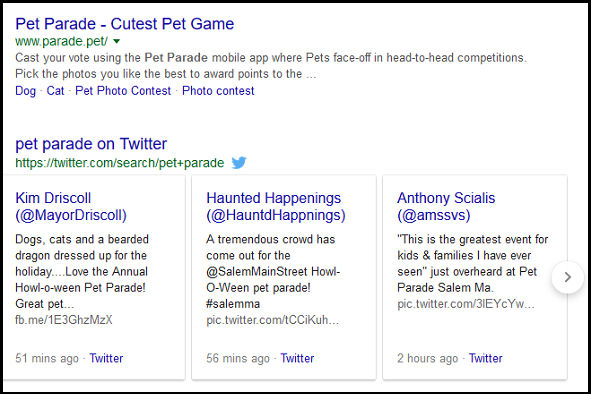 Customers and non customers (and especially their pets) either took part in the parade, costume contest or applauded in support to make this a really interesting community event that fits in nicely with Salem’s month-long Haunted Happenings celebration of all things Halloween. Salem Main Streets, which creates and supports numerous community events and initiatives throughout the year to promote the downtown district, thought up & produced this event. It did so with the support of Creative Salem, Salem Pet Photo, the New England Dog Biscuit Company, Artists’ Row, PALS, Black Cat Tours, It’s Reigning Cats and Dogs, Healthy Hounds Doggie Daycare, Penelope’s Pet Boutique, and a number of other community partners. Yes, there really are that many pet-themed stores in one city. What could other similar-themed businesses & organizations in your city or town do to engage their community of customers?